Sometimes restoring a watch is a labor of love. That's a nice way of saying that if you knew what would it require to restore before you started, you might have reconsidered. 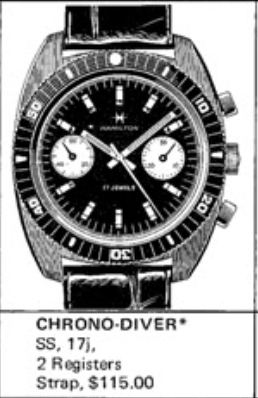 In 1970 Hamilton introduced a new chronograph model called the Chrono-Diver. It was produced through most of the 1970's and I'm not sure when it was finally discontinued. As you can surmise from the model name, the Chrono-Diver is a chronograph in a water-proof case that was marketing to sport-oriented enthusiasts. The case has a rotating ring that moves in either direction that allows you to estimate elapsed time - up to 60 minutes, anyway. In addition, it featured a Hamilton 647 movement which was based on the Valjoux 7733 grade. This 17 jewel manual winding chronograph grade was used in a broad variety of watch brands ranging from Breitling to Sears Roebuck. The Valjoux 7733 has two sub registers... the one on the left is the second hand for the watch and the one on the right is the elapsed minutes for the stopwatch function (chronograph). The central sweep second hand is the stop watch second hand and is positioned at 12:00 unless the stopwatch is running. Hamilton had other automatic chronograph models at the same time. Those watches often used a caliber 11 movement which was made by Buren and included a micro-rotor to wind the watch. However, the Chrono-Diver is strictly a manual winding model. So as you can probably guess, I landed a Chrono-Diver project watch a while ago. As received it was not running, had the wrong hands, the wrong pushers and the crystal needed to be replaced. Other than that, it was great. The case back is fairly plain. The watch model number is 647001-03. The -03 denotes the case is stainless steel. 40 years ago if I needed a part for this watch I could probably use the model number to order the needed parts. Today... not so much. Hamilton no longer supports watches this old. Chronographs are essentially a stop watch screwed to the back of an ordinary watch with special accommodations to allow power from the watch to be applied to the chrono-function and to allow the chronograph to drive hands on the dial. There's a lot going on inside a chronograph case. One thing I saw immediately wrong with the watch was it was missing a screw on the reset lever. The screw-head had broken off but I was able to back the screw-portion out. With a little fiddling I could get the watch to run with the stopwatch going but it would stop when I stopped the stopwatch. Well, chronographs are outside of my expertise for now so I sent this out to a professional watchmaker friend of mine. I also needed to find new hour and minute hands for a 7733 movement. Turns out that is an extremely hard thing to do. Hands are specified by the shape, style, length and the size of the holes for mounting. The best I could do was to find silver colored hands instead of white and they are a little shorter than they ought to be. But beggars can't be choosers and they're still way better than what I started with. My friend hooked me up with new pushers and a very nice replacement crystal. I added a sweet black with red stitching rally-style strap and voila! So yes, this was definitely a labor of love. First came a lot of labor but now there's nothing but love. If I had to do it over again I probably would. But I'd look for one that had the correct hands, pusher and decent crystal to begin with. Still, you won't hear me complaining, I love this watch. I have this watch, and I would like to have it repaired. When I wind the watch it only works for a few hrs. and or minutes. Send me an email or contact me through Etsy and I'll give you a couple of recommendations. What tool did you use to remove the case back? A case wrench, although a Crescent wrench would probably do the trick too. any idea for getting a replacement bezel? From another case is probably the only solution.